Minerva Lodge would like to congratulate our two new member on their initiations into Freemasonry last night. The ceremony went very well and was a great success. We were lucky to have plenty of visitors and a well attended meeting by the brethren. This is the third initiation we have done since the summer recess and we are extremely pleased to have these new members. If you’re intersted in joining Minerva Lodge please visit our contact page for details on how to get in touch with us. 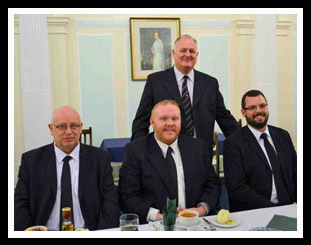 To the envy of many, members of Minerva Lodge No 4002 initiated two new members at their recent meeting in Liverpool Masonic Hall. Founded in 1919 as a ‘daughter lodge’ of Neptune Lodge No 1264 to help accommodate the large number of men seeking to join Freemasonry, many of whom had recently returned from the hostilities of the Great War and were looking for a source of continued camaraderie which they experienced in the services. The lodge was named after Minerva the virgin goddess of poetry, medicine, wisdom, commerce, weaving, crafts and magic. She was often depicted with her sacred creature, the owl, which was to symbolise her ties to wisdom. The emblem used by Minerva Lodge depicts her wearing a helmet to signify her role as a warrior and a sculpture of her in this guise sits atop the dome of Liverpool Town Hall. Interestingly, the last three years of the lodge has seen a member of the Farmer family in the Worshipful Masters Chair, firstly Robert in 2009, previously having held that position in 2005 and 2006, his son Gordon succeeded him for 2010, and this year saw another son, Martin occupy the chair of King Solomon. It was Martin who had the pleasure of overseeing the initiation of Dave Luing and Matty Timmins at the last regular meeting of the lodge and he is going to have a busy year with another lodge member due to be passed to the second degree, and one due to be raised to the degree of a Master Mason. The lodge meets on the second Tuesday of the months of October to April, with their installation ceremony in February, and always gives a warm welcome to any visitors. The New Group website has now been published for the Liverpool group of Lodges. Please take the time to have a look. Minerva Lodge was honoured at Provincial Grand Lodge by one its members receiving an acting rank on the 23rd May 2011. W.Bro Bob Farmer (below) received the rank of Provincial Assistant Grand Sword Bearer, and was proudly supported by his two sons as he received the honour from the Provincial Grand Master in front of a crowd of 1000 Masons from the Province of West Lancashire and other Provinces. We wish W.Bro Bob a very happy and busy year in his acting rank. Minerva Lodge had an Emergencey meeting this month, and although the “Emergencey” part may sound ominace it was a great occasion for everyone. We had a new member join our Lodge, and as it was the close season for us, and his work commitments meant that he wouldn’t be able to join until later in the year we decided that rather than let him wait through to December to join we would have a special evening to carry out our ceremony. The evening went without a hitch and we welcomed our new member Garth into the Lodge. We now prepare to greet 2 new members who will be joining in October and November respectively. As we break for the Summer recess once again we wish everyone the very best of Summers and look forward to seeing the Brethren back in the Lodge Room with all battery’s recharged and ready to carry out a very busy period of Ceremonies for our new members. Whilst going through some regalia we have received from the very kind families of Brethren of Departed Merit. We have uncovered a Jewel in every sense of the word. I’m not sure how many of these exist today but it’s the first one I’ve seen of its kind. We have found a Minerva Lodge Founders Jewel, which would have come into the possession of one of our Brothers from one or maybe two other departed Brothers of the Lodge. Please find below some Images of the Jewel that will be 100 years old in 8 years time. Sadly there’s no way of knowing who this Jewel belonged to as there is no engraving on it, the only thing it came in was the original box from Toye and Co and there is no name written in that either. It should be available to be seen by all Brethren of Minerva and any others that may be interested in it. I’m sure further discussions will take place at Committee to decide its future. The worshipful Master Martin Farmer was pleased to attend the Province of West Lancashire, Masters and First Principals Ball at the Reebok Stadium in Bolton. With over 600 in attendance it was one of the premier functions this year and was thoroughly enjoyed by all. The Lodge Installation was a massive success again this year. We saw Bro Martin Farmer Installed in the Chair by his Brother Gordon Farmer which see’s a three year family dominance by the Farmer Family conclude. It began with Father Bob Farmer taking the Chair then passing it on to his eldest Son Gordon who then installed Martin. The event was very well attended with many friends visiting us from different Lodges and we were very fortunate to have The Deputy Provincial Grand Master at our event the V.Worshipful Bro. Brian Gillbanks. We were also honoured to have Assistant Provincial Grand Master, Michael Hedley Hill in attendance, as well as representatives from the Sandon Group and two other group Chairmen. We would like to thank all our guests, who make these events such good fun and such successful evenings and look forward to seeing them all again soon. 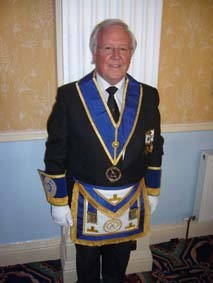 We also wish our new Master Martin Farmer the very best for his year in office.